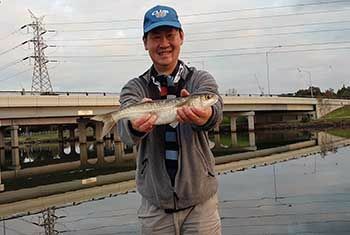 Jeremy Ang and I decided to try Lynch’s bridge a popular fishing destination along the Flemington racecourse. This can be an interesting place to fish with lots of structure near the bridge pylons, strong tidal flow and challenge of avoiding snags with rocks and debris. I caught many small Bream. Many of the Bream taking the bait on the drop, so having the rod in the rod holder meant many missed opportunities. Jeremy caught a ripping 41 cm Mullet which gave him a nice fight after nearly taking his rod into the water. We had many say hi that recongised the FishingMad brand.